Vegan Indian Desserts and Sweets, No cheese, butter, milk. While we all seek to explore international desserts once in a while, the charm of our own traditional Indian sweets and desserts are boundless. All said and done, our palates are blindly in love with the rich magic of our mithais. The best part is that Indian culture is so varied that there is no dearth of variety in our own repertoire. We have carefully selected recipes which avoid using non-vegan ingredients such as milk, malai, ghee and so on. Combine nuts and sugar and you get Dry Fruit Chikki. If you love coconut then Coconut Chikki or for cashew lovers there is Cahsew Chikki. Try the famous Petha from Agra. Pista Barfi has a mild nutty flavour and attractive colour, both of which make it very tempting. We have made this dessert Peanut Coconut Ball dessert which has healthy fat and Cocoa Powder. 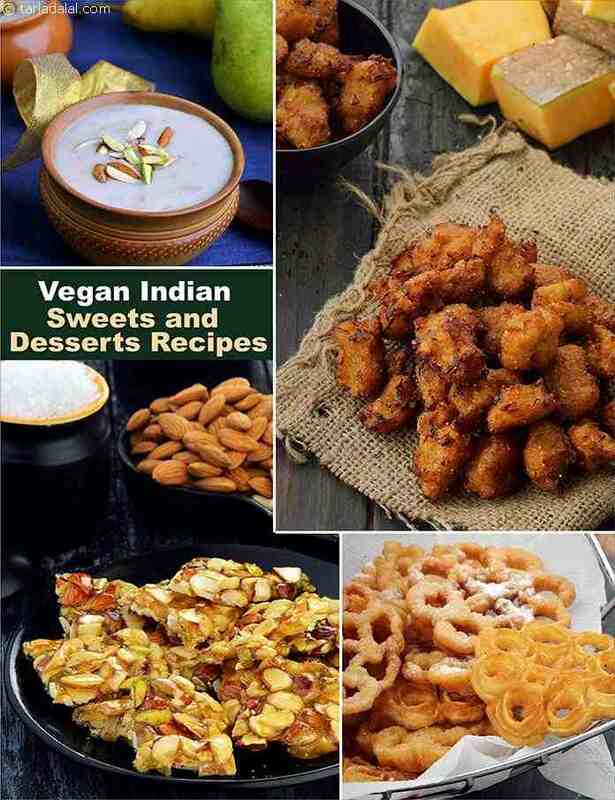 So get wiser… Use your stock of vegan ingredients to make these Indian delicacies... All these recipes have been designed to suit the taste, texture and flavour appeal of people at different stages in life.